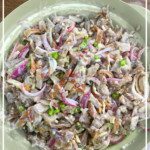 Dinakdakan is originally from the Ilocos Region. It is an appetizer dish that makes use of boiled and grilled pig parts (ears, liver, and face) called Mascara. Boil the pork cubes in water with salt until tender. Remove from water when cooked; set aside. Meanwhile, grill the variety meats until tender but not crispy. In a bowl, mix the Pork Cubes and the variety of meats. Add the garlic, minced onion, calamansi or lemon juice and mayonnaise (or mashed brain, if you have the dish to be traditional). To add spiciness on your Dinakdakan, add more chopped chilis. This video shows another recipe for dinakdakan.